Objective: God will help me make the right choice even when those around me do not. 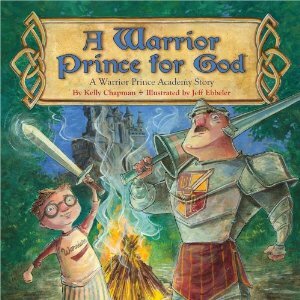 Name the people in the Bible story. How did Esther have courage? Esther had courage to do what God wanted her to do. What do you need courage to do? Information: Write phone number & address. - It takes courage to stand up for what is right. Discuss and role play examples of peer pressure and how to handle it. For example: Your brother told you to eat a cookie but you heard mom say earlier that the cookies are for after supper. Can the objects be seen? Are the objects still there even though they can't be seen? How do you know that the objects are still there? (Remove the blanket.) Just like our memory verse says, "When I am afraid, I will trust in you" because Jesus is always with us even though we can't see Him. - Spread a thin layer of glue on the Esther worksheet. Cover with small squares of tissue paper. Let dry and cut out. (Esther means "star.") Spread margarine on flour tortillas. Sprinkle with cinnamon and sugar. 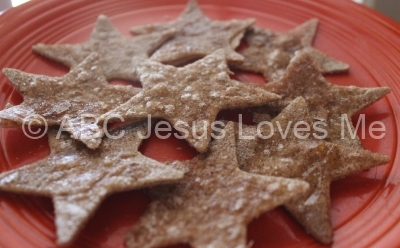 Using a star-shaped cookie cutter, cut stars out of a flour tortilla. Bake approx 10 minutes in 350 degree oven until crisp. God took care of Esther and Mordecai. As a family talk about times that God took care of your family in the past. Start each moment with the words, "Remember when...." It may take a few examples from the adults for the child to think of an example. End the time with a prayer of thanksgiving. - Make various patterns with Legos. Have your child tell you the pattern. Switch and have the child make a tower and you tell him the pattern. - Weeks 31-32 focus on the kick characters - those characters that kick out from the center point. 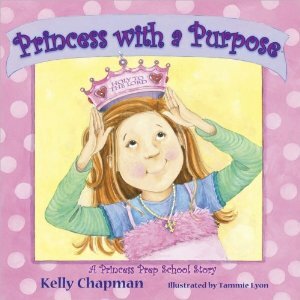 Start by creating the characters P and K using play dough snakes or pipe cleaners and move to writing on the Kick worksheet. Show how an "R" is made by making a "P" and then "kicking out." Place approx 14 pieces of candy in a see-through container. Discuss what estimating means. Have your child estimate how many pieces there are in the container. Using the numbers your child wrote, lay the pieces of candy on each number to see the correct amount. 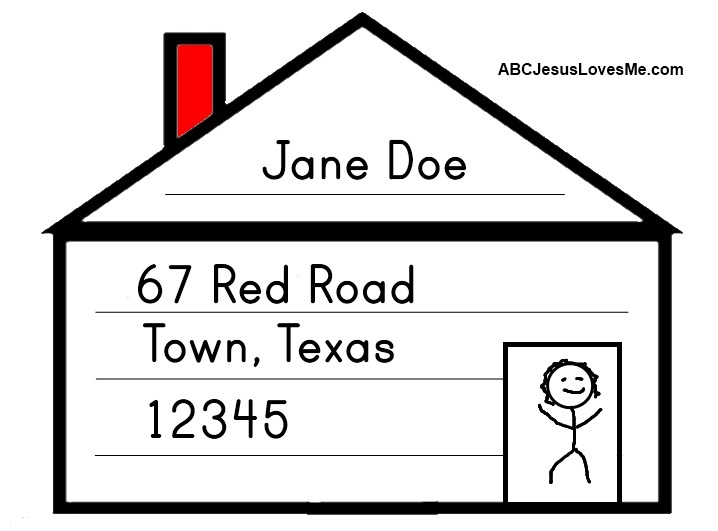 - On the My Home worksheet, help the child write his phone number and address on the house. Have the child draw a picture of himself in the doorway. Cut, color, and finish the My Purple Book. Help your child read the lines. - Discuss what occupation your child may want to do when she grows up. - Take a field trip to various workplaces to view different careers. 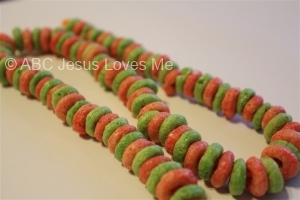 Create an edible necklace by stringing fruit loops in an AB pattern on lacing string.